The European Parliament’s mail room looks like a florist’s shop, with bundles of flowers on every flat surface. Hundreds and hundreds. There are flowers being carried by somebody in practically every elevator ride. Those are the inside reports from the European Parliament in the wake of the ACTA rejection. 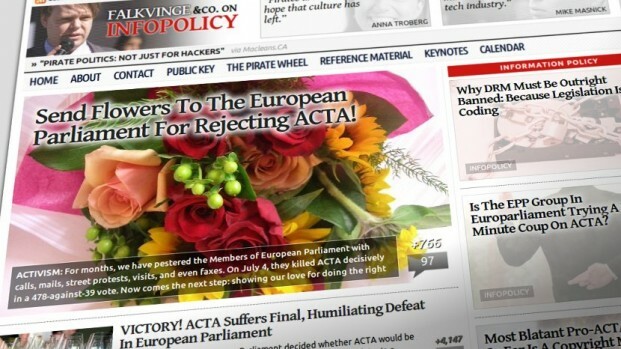 On Wednesday July 4, the European Parliament rejected ACTA overwhelmingly. The idea of sending flowers was carried and spread by many (766 shares and counting – each +1 of the +766 is one share somewhere, and one share can reach just one other person or it can reach hundreds of thousands), but from what I’ve seen, I’d like to give particular credit to Glyn Moody, the Anonymous hive, Enrique Dans, and Kim Dotcom for using their range and reach to spread the message, but do note that they’re still just one +1 each. This was a grassroots reaction. So what does it look like in Parliament, then? Christian Engström, Pirate MEP, has written a blog post about it, and Pirate MEP Andersdotter’s assistant @Senficon has posted pictures, too. Still, I predict most of the flowers will arrive tomorrow Tuesday rather than today. 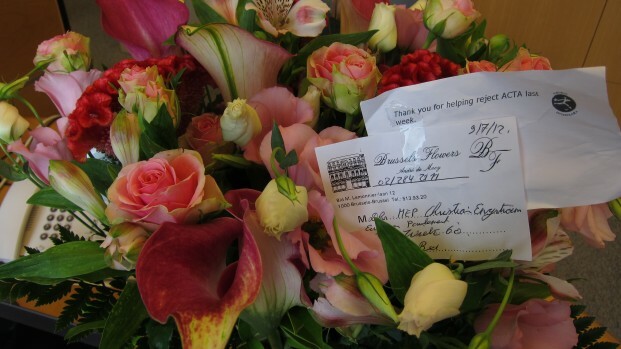 I’m very happy that so many chose to follow the suggestion and do as I did, sending flowers to a random Member of European Parliament who helped preserve our civil liberties against encroaching corporate interests. 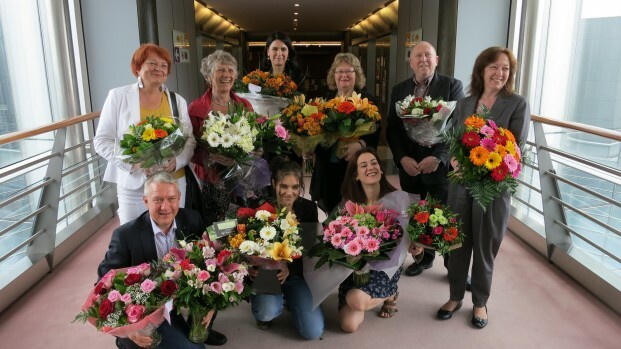 A bit of a group photo: some Members of European Parliament with flowers. I’m so proud of being part of this. The impact of this will send a message to every MEP on who they truly represent. As a Swede I sent flowers to a Belgian member. That by itself is a strong message telling that EU is one entity with one destiny. Thanks to all who contributed! Heres hoping that flowers from Norway shows that you also have impact on non-member states! Just checking in as another Norwegian who sent flowers. Mine won’t be there until thursday, unfortunately, though. But I hope more people keep sending troughout the week. I sent flowers to a random “Yes” voting representative. Luthuania I believe is where I sent them. Ehm… why? If you think that ACTA is good, please explain, because all I heard is that it would “protect jobs” on the pro side and risk fundamental rights on the net and risk hundreds of thousands of poor people’s access to medicine (according to Medecins Sans Frontieres) on the down side. So even if the proponents are right about the economical aspect (which I think they are not), I’d say that fundamental rights and the lives of hundreds of thousands of people clearly, clearly, clearly outweighs the economical argument, by far. Get real. Who told you that? Troll. 1) You’d remember who you sent it to, if you had. 2) It’s spelled Lithuania. You’d remember that too. 3) Nobody (not one) from Lithuania voted in favor of the thing. Next time lets throw them a block party. There is something quite poetic about “saying it with flowers”. As you say, it shows this is a “grassroots” effort, and, like flowers, creativity and art blossom all around us without government-granted monopolies. You could also say that sharing plants is like “seeding” files to your peers. I suggest that flowers and flower showers become an additional symbol of the worldwide Pirate Party movement. I don’t think it’s a good idea to sent flowers whenever a certain political party is happy about the outcome. This can be counter productive. But Rick and everyone else: [b]ACTA is not dead[/b]. The European Commission is trying an evil plan of [b]passing ACTA through CETA[/b], a trade agreement with Canada of all countries. But Canada can simply cut out the ACTA part if they wish. And if the European Parliament is enlightnened about this, they can stop it. So [b]e-mail parliament and Canada today[/b] and spread the word! Don’t know whom to e-mail in Canada, perhaps Rick can find out? And Rick, clearly you must blog about this! seems like defeating a bill means nothing. it just keeps coming back to haunt and those that introduced the original dont learn a thing from the defeat either! Yesterday, the net’s alarm bells went off all at once regarding a new trade agreement – a CETA, an agreement between the Canada and the European Union – that would sneak ACTA’s provisions into law through the back door, now that ACTA had been forcefully rejected by the European Parliament. The whole net was angry with the European Commission and its disrespect for democracy. However, the leaked docs were written in February 2012, when it was all but certain that ACTA would pass. So this is not “ACTA rises again”. This is not “ACTA, the First Zombie Remake”. This is an entirely logical document as it would have been written in February of 2012, written with the political assumptions of its time in mind. Currently on vacation in Spain, I thought I’d send my flowers to a Spanish MEP. Hope that every no-voter gets at least one bouquet. I also sent the flowers to the MEP selected by a fair dice roll. I didn’t retweet. I wish to remain anonymous in public. Only the MEP knows who I am and why (s)he got the flowers. Epic win. I hope the message gets through. I wish I could send flowers to the ones that vote the right way here but unfortunately the votes are still secret. Great idea, this random list of no-to-ACTA voters. As a Dutch I sent flowers to a Spanish guy.